We present you a new toy to play with eKameno. You can have fun with your lights using LuzWifi. Using the new Color Model you can set-up different modes such as White Mode, Relax Mode, Party Mode and Music Mode. If you switch on Music Mode lights will react depending on your music. You can screw the lamp as you do with a normal one. 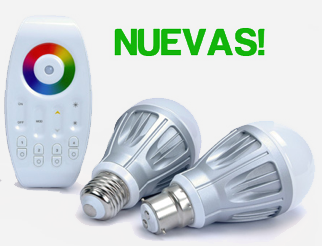 Once you have configured it you can control the lamp from inside or outside home. That is why we suggest you to use it when you are away from home. You can turn on the light for a while when you are on holidays and your home will look like someone is living inside. Firstly, configure the lights followings the producer’s instructions. Then install the Plugin LuzWiFi on your NODE Device in order to use the lights with eKameno.